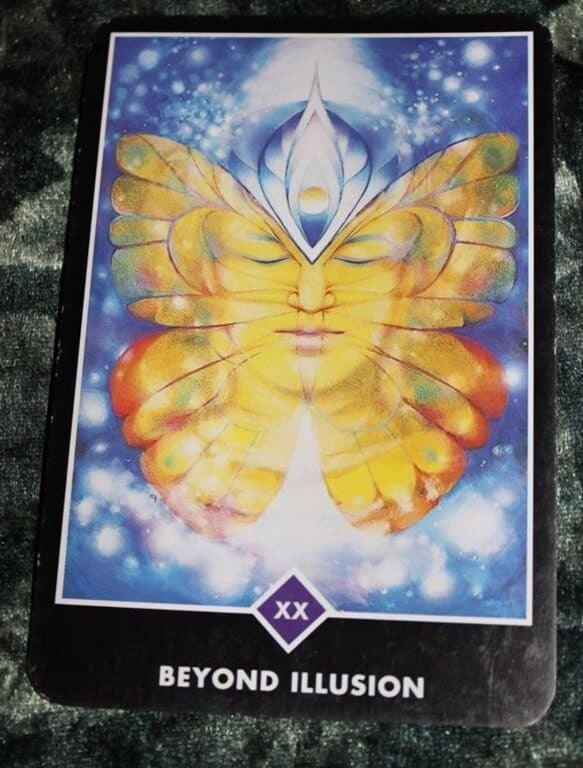 I will say what I so often want to say when I see the Judgment card—here renamed “Beyond Illusion”—blame is not especially relevant. Declaring blame irrelevant seems almost sacrilegious in discussing this card. Judgment Day, right? A free pass is not what I’m looking at. Not even close. What I’m advocating is actually much harder than handing out free passes. There is a difference between dispassionately understanding situational dynamics and emotive finger wagging. Pinning an “At Fault/Broken Human” badge to yourself or someone else is pointless. Not constructive. I cannot learn anything when I’m knee deep in rage or overwhelmed with a sense of inadequacies. Assigning blame so often brings unnecessary complications, attachments. But more importantly, schlepping blame around can distract from processing the whole of a situation, in full color. Judgment can move beyond illusion precisely because this sort of judgment (at least to me) is fully without attachment. It’s dispassionate. It’s intellectual and if we’re lucky, compassionate. The goal is understanding, not punishment. Sometimes, just desserts may feel like punishment, but that’s another issue altogether. We are human beings. Our days are crammed full of victories and missteps. That’s the bittersweet beauty of being human. The Judgment card would have us move beyond the illusion of old stories we may wish to cling to, such as they are, for a broader, more celestial perspective. Today, look at everyone’s role as an angelic outsider might. Be willing to set aside your own story in order to gain useful information outside the story’s context. Think not in terms of protagonist and antagonist, but in terms of dynamic systems where each component has a part. That approach promises the most useful gains. What does this card say to you? It’s been hell since last night – the long story is on my FB page from last night, and I’ve not been on a lot today either – but this is what I did today. Not only for the husband, but for someone else as well who blames me for things I had no hand in at all.